As I was starting to hollow out the pegbox, the scroll just popped off. I accidentally knocked it off my bench earlier and I guess that cracked it. What is the proper way to repair this? Is the fix as simple as glueing the pieces together with some high strength hide glue? That happened to me once. I was hollowing out the pegbox and levered my chisle too hard against the scroll. At first I was shocked. Then I saw that the split was perfectly clean. So I took a picture of the peghead with the scoll facing backward, for laughs. Then I glued the piece back on with hide glue and hand pressure for a few minutes. I didn't show at all and I don't even remember which fiddle it was anymore. Hopefully, your split is clean. Even if it's not perfect just glue it together as well as you can and see what the result is. At least you have easy access to hollow out the pegbox .. as bkwood said, just glue it back. it's one more glue joint in a place that is neither structural nor acoustical the most important part of the violin. You weren't perchance using hammer and chisel to hollow out the pegbox, were you? That has a really bad track record. Just a sharp hammer blow on the back of a heel can knock the scroll off. Just goes to prove that there are two sides to every story. As Emilg pointed out you can now finish carving the far depths of the hollow but, as an extra plus, you can now puzzle everyone by carving the flutes right round into the dark corners of the scroll. The downside is that thereafter you'll have to suffer people looking at your next instrument and saying "Tut, tut - the scroll isn't as good as your previous one"
I'll glue it back up tonight. David: Yes, I was using a mallet. Live and learn! bam, bam, bam, clink(as every one in the room turns to look.) That was the question I was going to ask. Of course it’s a shock to see your work damaged by one move, but the break is above the peg holes, so if you glue it well, it ought to be solid again. Make sure the glue surfaces are completely clean and that your glue is strong for a good bond. Going to clamp it or just hold it there? 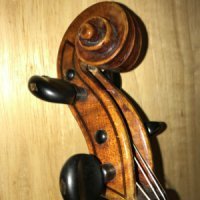 I have a violin that appears that the scroll broke off during the creation like yours. 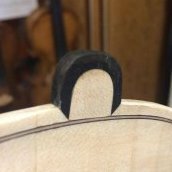 To repair it, it looks like the maker drilled into the top of the volute to the bottom part, and then inserted a recessed pin in the hole to add strength when he glued it together. He then plugged the top with fresh wood, and re-carved the fluting around the wood plug. It is an excellent repair that is hardly noticeable. And it has lasted for 119 years. Saw an ad for a 5 string bass with a stub extension to take it down to a rumbling Ab. Apparently the owner played a lot in theater pits and sawed off the scroll to maneuver through low doorways. He used magnets to hold the pieces together for decoration when he played above ground. Is the fix as simple as glueing the pieces together with some high strength hide glue? You might have a bad piece of wood there. Those dark streaks like the one running through the A string peg hole sometimes indicates a weak part of the wood prone to splitting. Just be careful after gluing it up, should you have more carving to do. I had a scroll break away once, and I drove the chisel into my hand. Dumb question maybe... why not just make a new scroll? Then you don't have to worry about how to fix the inevitable step from gluing, and you get carving practice and a chance to fashion another best yet scroll. Discarded or broken scrolls are plentiful around my house, literally. They get marbled and used as garden decorations. Yes, I am weird. I celebrate how slowly instruments are completed, the more I know what goes into them. But if they aren't right, or anything registers as "meh", in any way, you can always choose to try again to do it right. It might be a good habit to start now. Those who indulge the "good enough" mindset on such things rarely correct it, and will usually justify worse and worse structural or workmanship issues over time. And anyway, why not treat even your first instrument like it matters? This is probably a dumb question but I don't usually mind being the only one on these forums who asks a question that is probably dumb. Oh this brings me flashbacks from my second attempt at carving a scroll! I wasn't happy with it overall anyway so I made a new one, and that one came out to my liking! If you are going to glue it, and glue it well, one of your challenges will be coming up with clamping jigs which allow positioning the separated pieces quickly and accurately, and put the clamping force through the center of the joint. If you want to post photos of your proposed setup prior to gluing, you'll probably get some valuable input. I would just hold it in place, like I do with corner blocks, to avoid all the complications. Apart from anything else I reason that it is better to do it quickly and without disturbance. But I'm just a hack . I would just glue it and hold with fingers till the glue catches well (minute or so) and put it aside to dry in position with scroll above the crack like in rubbed joint of plate. With an antique instrument, I would definitely be in the “glue it back on with your fingers, and leave it overnight” school, although others had weird and wonderful jigs (that I wouldn't touch with a barge pole). With a new violin scroll, that doesn’t look anything like finished (the OP case), I would just chuck it away and start again. Since this is still the early stage of finishing the neck, where scroll can still be subjected to some accidental impacts and stady loads during your working process, I would go with new scroll too. Otherwise, for example, rubed center joints on backs seems to be sucessfully used by many makers (I use it anyway, with zero failure/problem till now) so "glue it, hold and leave" can be all you need if you want to procede with it anyway, and if you have a clear break. On the other hand I do clamp my neck joint. On a rubbed center joint, the sliding of the two surfaces will work out most of the excess glue. Such a sliding action is impossible when gluing this scroll, without really screwing up the hills and valleys which index together on either side of the break. Over time, the bonding properties of hot glue can deteriorate badly, if the glue bridges much of a gap or is used as a gap-filler. This is quite different from adhesives like epoxies. I would recommend clamping when possible, which should be pretty easy in this particular case, compared to breaks which involve some combination of weird and complex angles running all over the place.